Live Preview before you buy any Data Recovery Software by WizardRecovery. The LivePreview technology allows users of both free and registered versions of data recovery products by WizardRecovery to preview files and documents being recovered - before actually recovering them. LivePreview supports a number of file formats such as documents created with Microsoft Office and OpenOffice, images and digital pictures, including RAW files, movies and music. The technology displays images, open documents and plays back audio and video clips without writing anything onto the hard disk. LivePreview can even enter ZIP and RAR archives to show what's inside! If a file is corrupted or partially overwritten, LivePreview instantly repairs the file before displaying it on the screen. First and most obvious, LivePreview allows seeing whether or not a file is actually recoverable. If you can see a preview of a file, you can definitely recover it. Working in both free and registered editions of all WizardRecovery products, LivePreview makes your purchase decision much easier. Working with files such as Office documents means there are multiple versions of them as a result of multiple saves. Choosing the right version among the clutter of different versions is easy thanks to LivePreview. The technology displays all versions of each document, allowing you to choose the latest one among multiple files with the same name. Windows can always choose to use free space made available by deleting a file to store another file. This way, deleted files start to overlap, occupying the same physical space on the disk. It is essential to recover the only right copy of each file; if you save the wrong one onto the same disk that contains the original deleted file, your chances of recovering the right one after that are slim. LivePreview lets you pick the right file by showing its full preview. If you see garbage instead of proper content, simply move along to the next file! LivePreview is real simple. 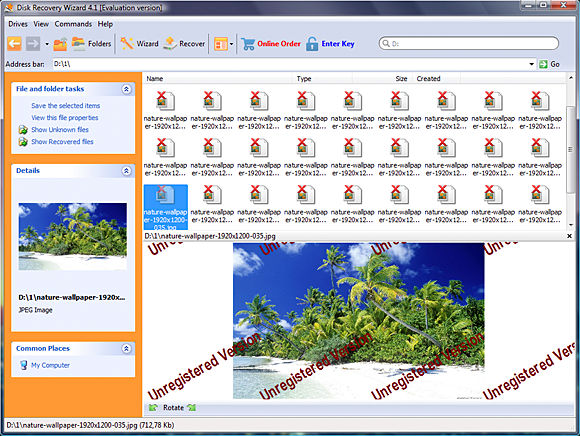 The following screenshot demonstrates how LivePreview operates in Disk Recovery Wizard. WizardRecovery constantly updates the LivePreview technology. Currently, LivePreview supports over 150 different types of files. LivePreview displays previews of documents saved by Microsoft Office 95-2007, StarOffice and OpenOffice. LivePreview automatically repairs Microsoft Office documents that are corrupted or partially overwritten. The technology does not require Microsoft Office, OpenOffice, or StarOffice installation. LivePreview can preview pictures and images in TIFF, TIF, NEF, PEF, X3F, JPEG, JPG, TIFF, BMP, PNG, GIF, TGA and other popular formats. The technology fully supports RAW files produced by digital SLRs manufactured by Canon, Nikon, Olympus, Pentax and Sony. CRW, CR2, RAW, NEF, PEF, as well as many other RAW file formats are supported. LivePreview can enter ZIP and RAR archives, listing and previewing compressed files without saving them first. Many popular video and animation formats are supported by the built-in media player. LivePreview can play back deleted AVI, VOB, MPG, WMV, and even the newest high-definition Blue-ray video clips. The technology does not require any external codecs to be installed in order to play back video clips. The built-in media player plays back audio clips and tunes in MP3, WMA, ASF, WAV, OGG, WV, RA, RM, VQF, MID, and VOC formats. LivePreview is fully multithreaded, allowing you to play back deleted music while recovering other types of files.